From last 70 years we all (right from pan shop to parliament) are talking about the Skill Based Education System. PMKVY is the first Effort to create this Skill Based Eduction system in India. 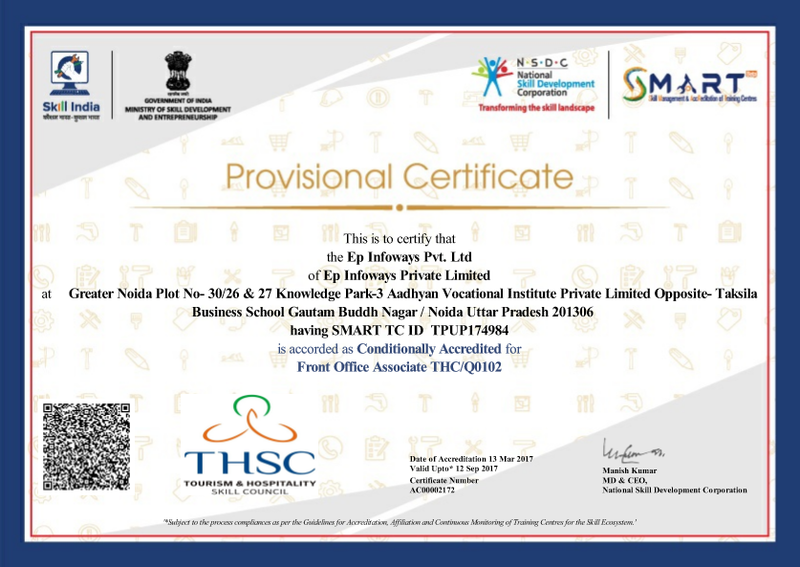 Some of the key points are – – Standard Curriculum across India – Mapping of Skill Certification with the Formal Education System – 3 key points Training Center , Trainer and Trainees are clearly monitored with a proper system for real implementation of the program – Standard Rates for Training for all courses – No Confusion for the Infrastructure requirement and lab requirement – Initial Support to run funded program and for higher level of courses money can be charged – Acceptance of Skill Certificate across countries and corporate We are inviting Application from Institutes/Training Centers/Companies/NGOs/Schools/Colleges having Unused Independent Training Infrastructure more than 3000 sq ft at any location in India and have passion to become part of this historical revolution. 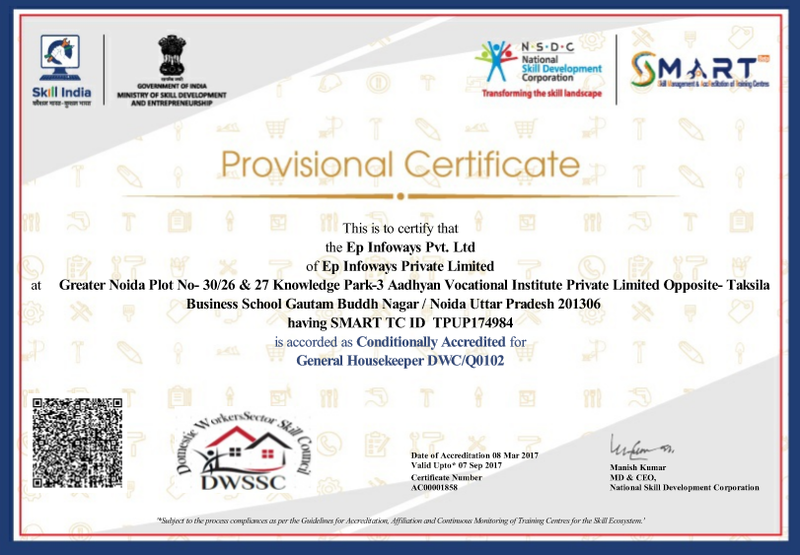 EP Infoways is Training Partner for PMKVY ( PMKVY – Pradhan Mantri Kaushal Vikas Yojna) . 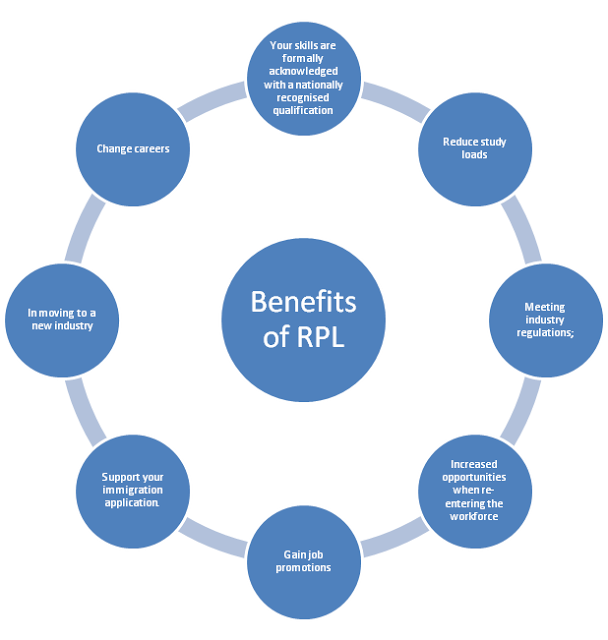 Recognition of Prior Learning (RPL) is a process of identifying your knowledge and skills against a qualification or part thereof. The process involves the identification, mediation, assessment and acknowledgement of knowledge and skills obtained through informal, non-formal and/ or formal learning. It is concept of recognising and accrediting — what people already know and can do — is having a significant impact on many of the education and training programmes currently being developed. This is irrespective of whether that learning has been acquired through unstructured learning, performance development, off-the-job assessment, or skills and knowledge that meet workplace needs but have been gained through various previous learning experiences. It is type of skills assessment process allowing new and current students to achieve all, or part, of a nationally recognised qualification by demonstrating their knowledge, skills and experience around a particular topic. 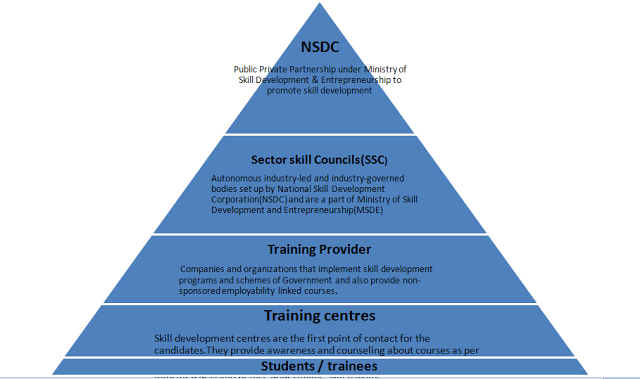 Shaping/creating: In the near-term, the NSDC will proactively seed and provide momentum for large-scale participation by private players in skill development. NSDC will identify critical skill groups, develop models for skill development and attract potential private players and provide support to these efforts. o Participation in the setting up of affiliation,accreditation, examination and certification norms for the respective sectors. o Provide awareness and counseling about courses as per the qualification and interest of the candidates to help them take an informed decision before undertaking skill training. o In the present skill development ecosystem, representatives of the training centre(mobilizer,counselor or influencer) explain the courses offered and programmes and schemes under which a candidate can enroll for training. o Provide opportunities for classroom and practical training, peer and industry interaction, employability and soft skill training and finally the placements. o Training centres have the maximum responsibility in successfully implementing skill development courses and programmes. A well-established and efficiently managed training centre is an asset and a profit centre for a training provider. In Skill Development Govt is First Time trying to create a ECO system which will compete with the formal educational structure at the same time provide opportunity for a career. Lets compare two career path…. One person from a middle class family completes his/her 12th class from a CBSE school and his family takes loan for his engineering education from a pvt college. After Btech he/she does not get a job from campus After spending 8-10 lac and 4 precious year outcome is zero ………….Another situation when a Poor family student completes 12th from govt school and he does not know what to do… with the govt funding he completes 2 month program in electrician and start a job at Rs. 6000 … slowly he joined other higher level skill program with his job and in next 4-5 years he completes his Credit Based Degree in Electrician and earning 15-18k per month…. He is Skilled and Have a Degree…………… This is the way forward………. With this Eco system this person can also go for Master in Electrician, even Phd in Electrician and can proud on the work he/she does. Skill Eco System is providing opportunity for small entrepreneur to come forward and give their life in the progress of nation. 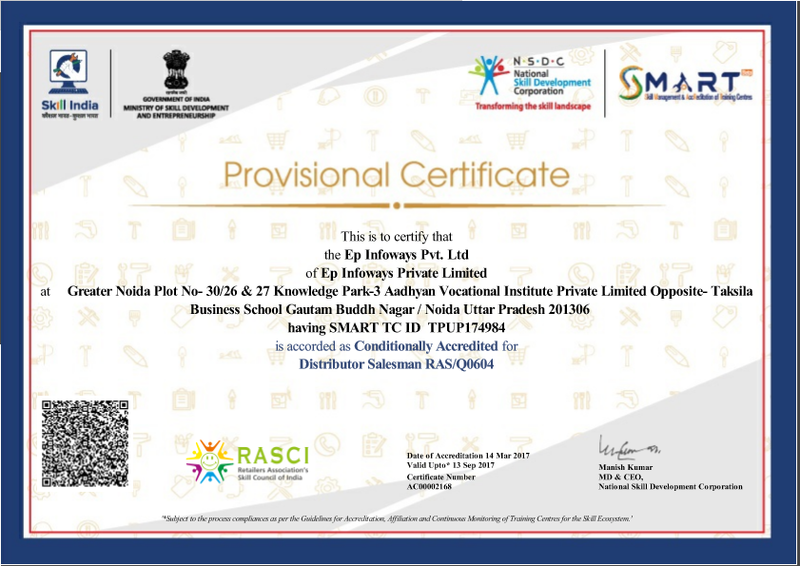 Thanks to Narendra Modi, Rajiv Pratap Rudy NSDC National Skill Development Corporation PMKVY – Pradhan Mantri Kaushal Vikas Yojna NSDC UDAAN for working to create a skill eco system in India. 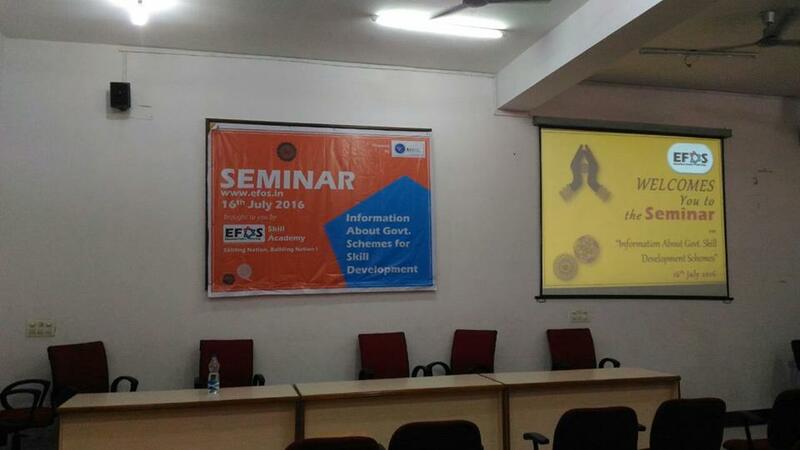 EFOS Skill Academy organised its second seminar on skill development on 16th July 2016 at Noida Management Association, Noida, Sector with a motive to create awareness on Govt. 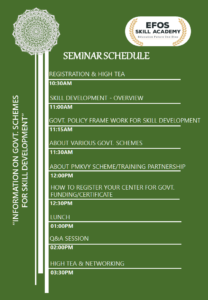 Skill Development Schemes. Seminar witnessed over 35 participants from all across the country(Maharashtra, Gujarat, MP, Delhi, Uttarakhand, UP, Haryana, Punjab, NCR) having thrust of knowledge in domain of skill development . Sachin Jain from EFOS Skill Academy and Gaurav Srivastava from Indraprastha Academy of Science & Engineering graced the occasion as speakers. 1. Sachin Jain — Director EP Infoways Pvt. Ltd , EFOS Skill Academy, Organizer of this seminar. 2. 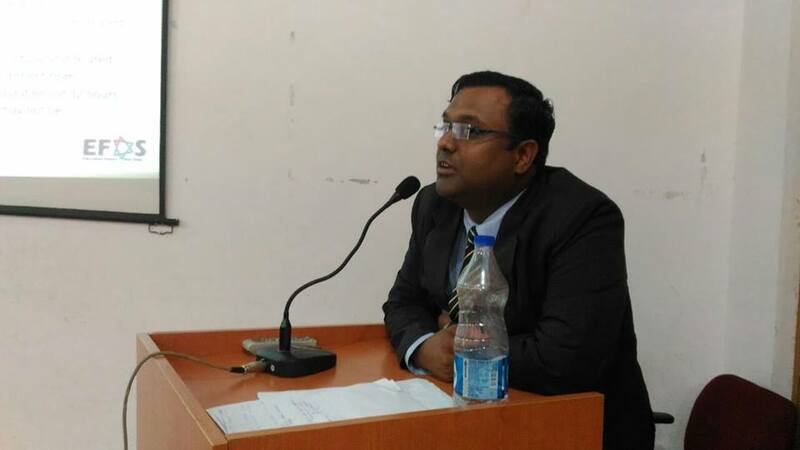 Gaurav Srivastavaa, Founder and Director Indraprastha Academy of Science & Engineering. Sachin Jain explained about Skill framework, NSQF, NOS, QP, credit framework , the role and importance of NSDC National Skill Development Corporation and NSDC partnership working model and shared about how PMKVY – Pradhan Mantri Kaushal Vikas Yojna will be executed. He satisfied the thrust of the participants by sharing his vast experience and learning in past in field of skill development. He also explain NSDC UDAAN project. Gaurav Srivastava,explained about various schemes of govt under skill development focusing on how to get affiliation for those schemes and the way they can be implemented at ground level. 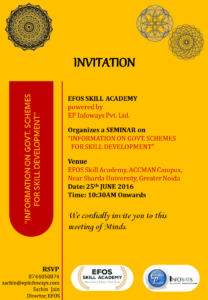 EFOS skill Academy feels proud to be able in contributing towards spreading awareness about changing Skill Eco system in India by way of these chain seminars and hopes that in coming future our team will be able to impact life of students by providing them skill training and contribute in the growth of our country. 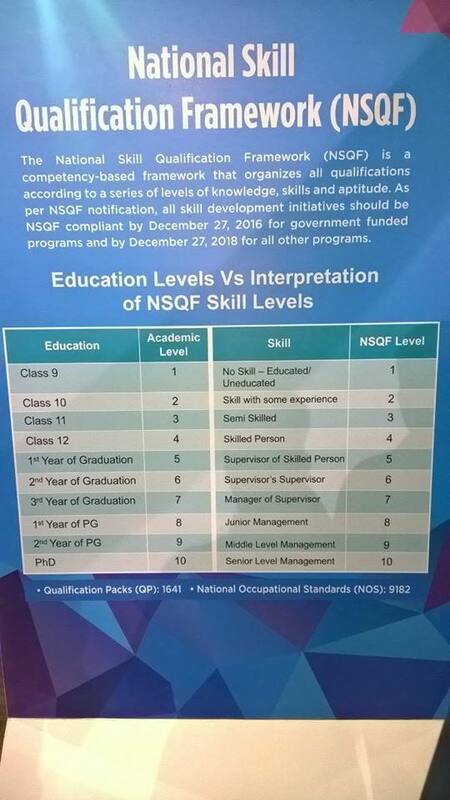 EFOS skill Academy feels commits itself for the successful implementation of the prestigious skills development projects and conducting skill training of high standards to lead the vision of developed India. Post lunch Q and A session was handled by Mr. Sachin Jain leading to one to one interaction with audiences and satisfaction of doubts in minds of participants. This session was highly fruitful and led to exchange of great information in this meeting of think tanks. All participants, speakers and organizers stood up and sang national anthem and took pledge to make India skill capital of the world. DrAkansha Jain Co-Founder of EFOS Skill Academy and Entire team of EP Infoways Pvt Ltd and EFOS worked very hard to create this event a success. We would like to thank Narendra Modi and Rajiv Pratap Rudyi for creating Long term, Transparent and Sustainable Skill Eco System for Indian Youth. It is creating opportunity for startups like EFOS to contribute in growth story of Developing India. 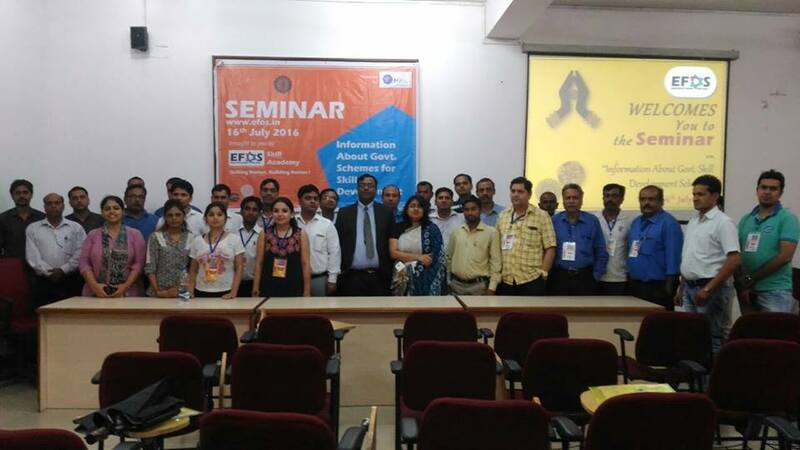 A Round Table Conference/seminar was Organized by EFOS Skill Academy on 25th June 2016 for team actually working on the ground for skill development and the road ahead. 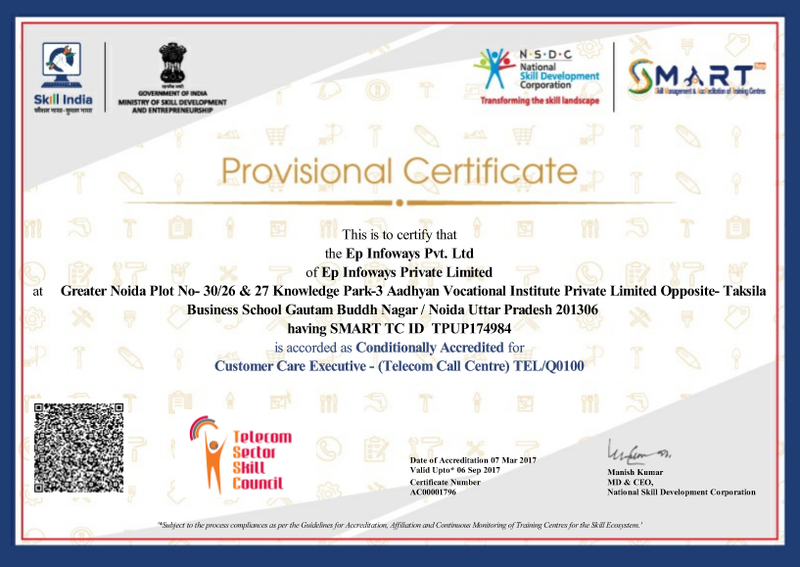 Honoured to have participation from Life Sciences Sector Skill Development Council and NASSCOM IT ITES Sector Skill Council Gaurav Srivastava, indraprasth academy.